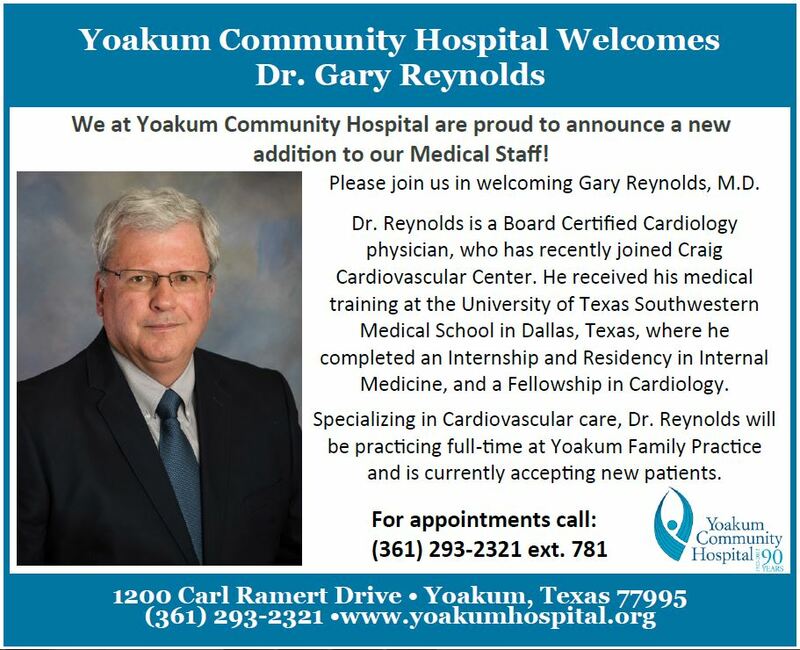 Yoakum Community Hospital is pleased to announce that Gary Reynolds, MD, will join its medical staff as an internal medical physician and cardiologist. Dr. Reynolds is also a new addition to Craig Cardiovascular Center, located at the Professional Office Building at YCH and is now seeing patients. Dr. Reynolds earned his medical degree from the University of Texas Southwestern Medical School in Dallas, where he received advanced training in internal medicine and cardiology. He served as Assistant Professor of Internal Medicine in the Cardiology Division of the University of Texas Southwestern Medical School at Dallas for three years. A native of New Mexico, Dr. Reynolds is board-certified in internal medicine, cardiology, nuclear cardiology and echocardiography. For more information or to schedule appointments with Dr. Reynolds, please call (361) 293-2321 extension 781.